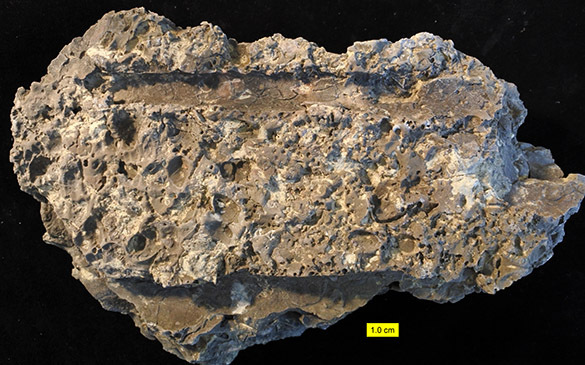 Above is an image of a carbonate hardground (cemented seafloor) from the Upper Ordovician of Adams County, Ohio. It comes from the Bull Fork Formation and was recovered along State Route 136 north of Manchester, Ohio (Locality C/W-20). It is distinctive for two reasons: (1) the many external molds (impressions, more or less) of mollusk shells, including bivalves and long, narrow, straight nautiloids, and (2) its many small borings called Trypanites, a type of trace fossil we’ve seen on this blog before. 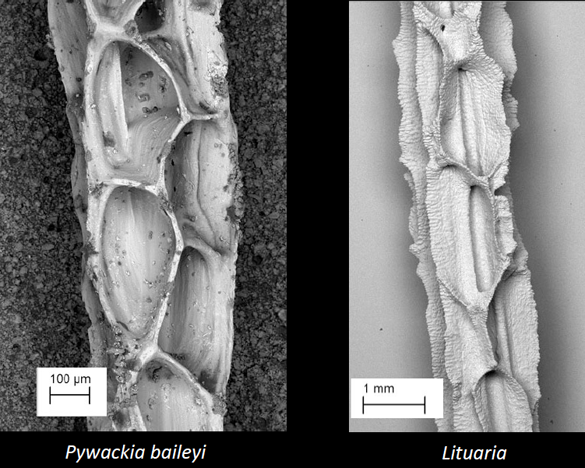 In this closer view we can see the shallow external molds of small bivalve shells, especially on the left side, and the many round perforations of the Trypanites borings. The dissolved mollusk shells (from bivalves and nautiloids) were originally composed of the calcium carbonate mineral aragonite. This aragonite dissolved early on the seafloor, liberating calcium carbonate that quickly precipitated as the mineral calcite in the sediment, cementing it into a rocky seafloor (hardground) that was then bored by the animal that made Trypanites. This all happened because of the distinctive geochemistry of the ocean water at that time. High levels of carbon dioxide and a decreased Mg/Ca ratio dissolved aragonite yet enabled calcite (the more stable polymorph of calcium carbonate) to rapidly precipitate. This geochemical condition is known as a Calcite Sea, which was common in the early to middle Paleozoic, especially in the Ordovician. This is not the case in today’s marine waters in which aragonite is the primary calcium carbonate precipitate (“Aragonite Sea“). See Palmer et al. (1988) for more details on this process and the evidence for it. 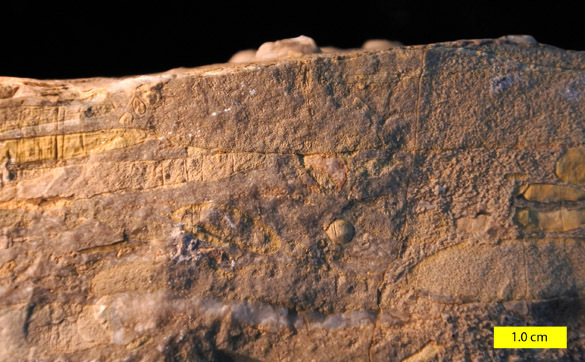 I’m using this Ordovician carbonate hardground to introduce a new paper that just appeared this week in the Proceedings of the National Academy of Sciences (PNAS): “Decoupled evolution of soft and hard substrate communities during the Cambrian Explosion and Ordovician Biodiversification Event“. The authors are the renowned trace fossil experts Luis Buatois and Gabriela Mángano, the ace geostatistician Ricardo Olea, and me. 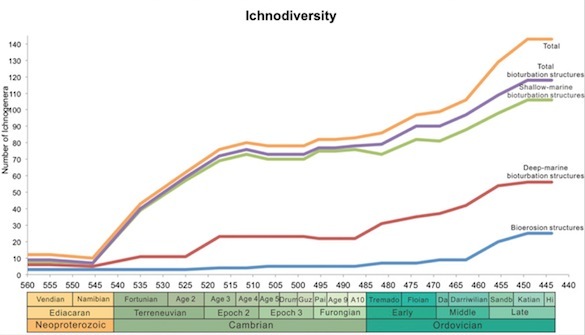 I’m excited about this paper because it adds to the literature new information and ideas about two major evolutionary radiations: the “explosion” of diversity in the Cambrian (which established basic body plans for most animals) and the diversification in the Ordovician (which filled in those body plans with abundant lower taxa). 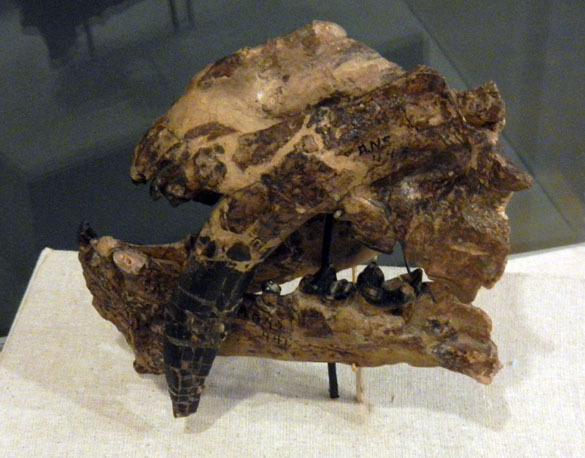 This is one of the few studies to look in detail at the trace fossil record of these events. 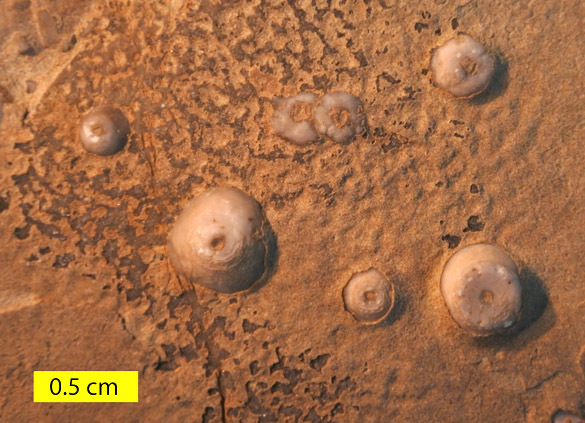 Trace fossils (records of organism behavior in and on the sediment substrate) give us information about soft-bodied taxa otherwise rare in a fossil record dominated by shells, teeth and skeletons. 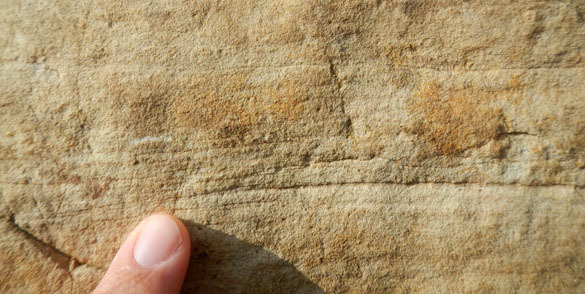 It is also the first systematic attempt to compare the diversification of trace fossils in soft sediments and on hard substrates (like the hardground pictured above). Thank you to Luis Buatois for his leadership on this challenging project. I very much appreciate the way this work has placed the study of trace fossils into a critical evolutionary context. Buatois, L.A., Mángano, M.G., Olea, R.A. and Wilson, M.A. 2016. 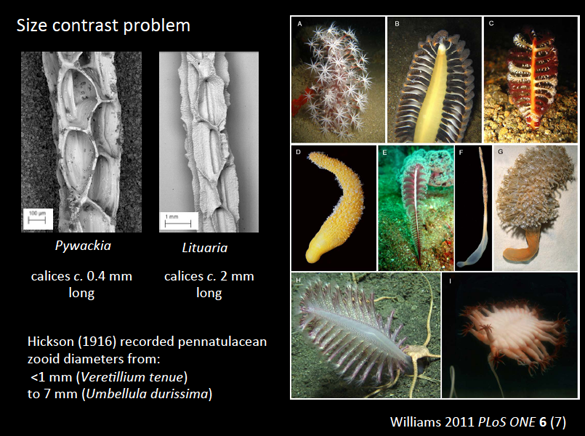 Decoupled evolution of soft and hard substrate communities during the Cambrian Explosion and Ordovician Biodiversification Event. Proceedings of the National Academy of Sciences (in press). Palmer, T.J., Hudson, J.D. and Wilson, M.A. 1988. 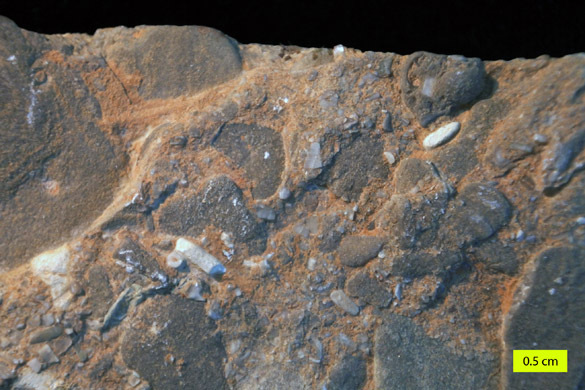 Palaeoecological evidence for early aragonite dissolution in ancient calcite seas. Nature 335: 809-810. 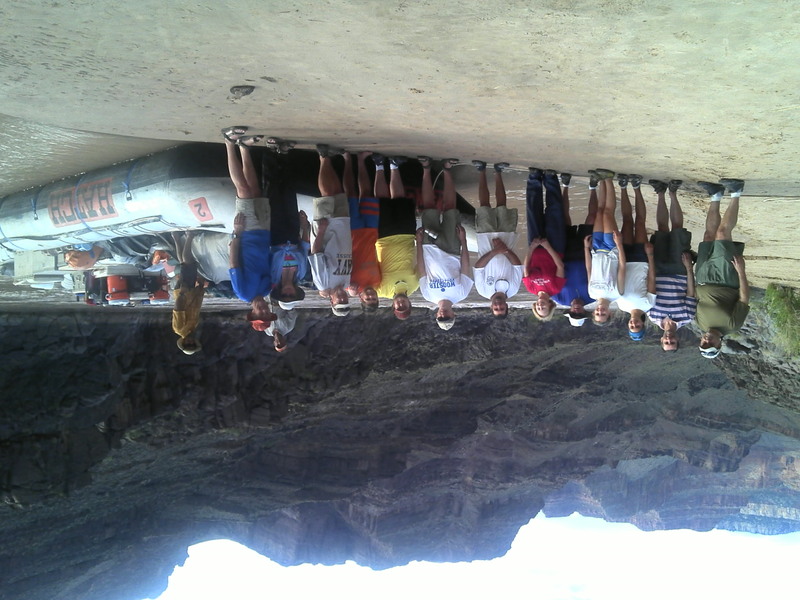 This summer (26 July through 2 August) I had the pleasure to serve as a guest geologist on a rafting trip to the Grand Canyon. The trip logistics were engineered by Doug Drushal under the auspices of Environmental Experiences, Inc. 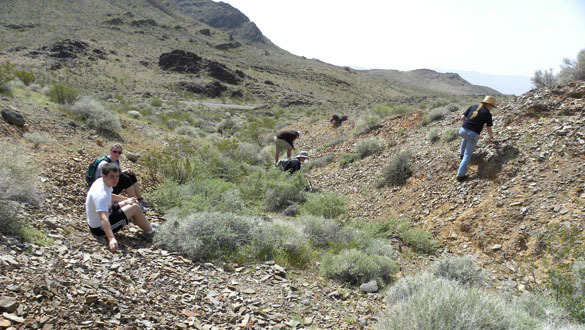 These trips were begun by former Wooster Geology Professor, Dr. Frederick W. Cropp III in 1980. 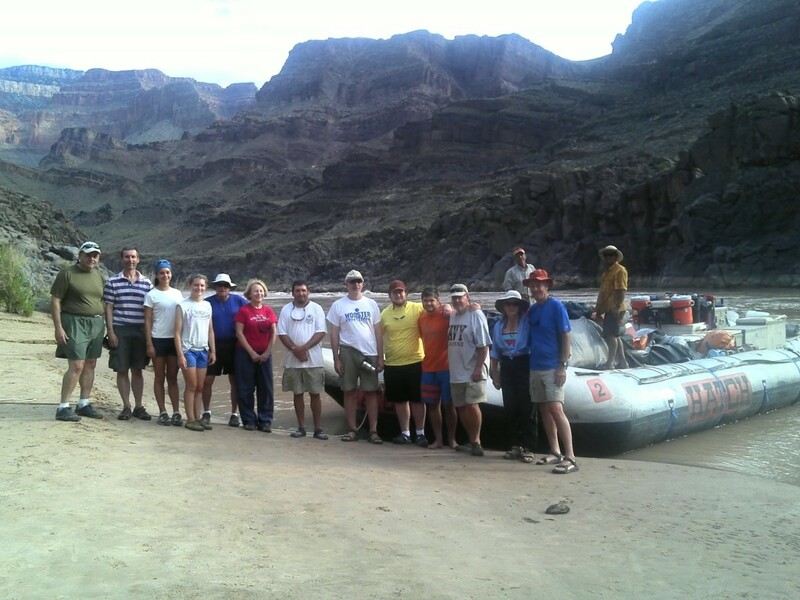 Doug and Fred’s son Tom Cropp have continued to provide the organization and logistics for these exciting and geologically enlightening rafting trips. 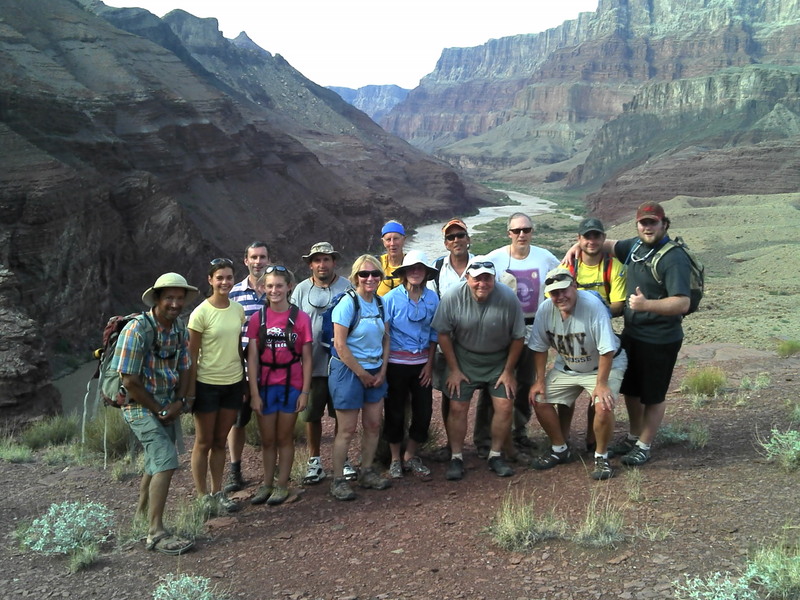 Special thanks to JP, our boatman, and Phil (swamper) of Hatch River Expeditions for sharing their knowledge and extensive experience of the history and geology of the Canyon. 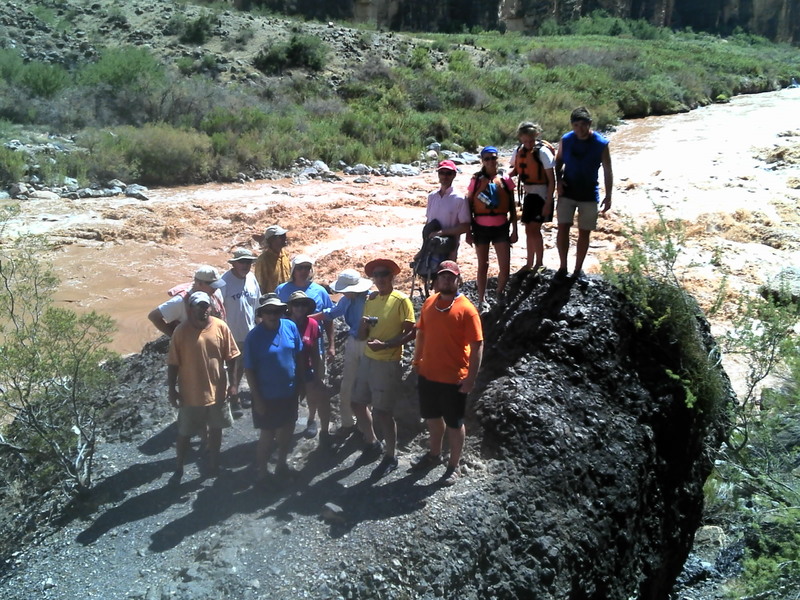 The group poses in front of the Great Angular Unconformity. Note the tilted Precambrian Supergroup underlying the Cambrian section consisting of Tapeats Sandstone and Bright Angel Shale (see the stratigraphic section here to remind yourself of the stratigraphy). On the boat is the boatman JP and swamper Phil. Some of the geological highlights are explained in the captions below. Not only were we treated to classic geology, but we also were able to experience and view some of the power of water in the canyon – flash floods and debris flows. 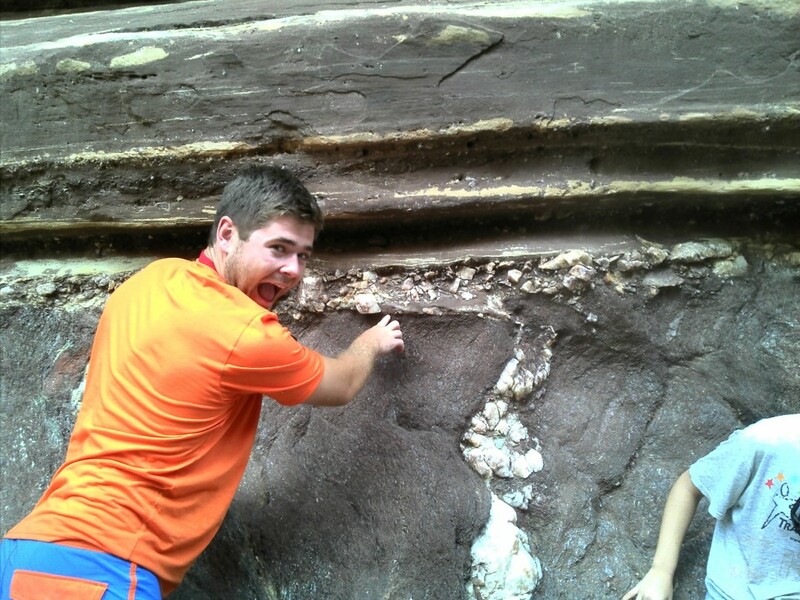 The reverse exfoliation in the Permian Esplanade Sandstone is one the the best examples of its kind. Usually when we discuss exfoliation we think of domes. The homogeneous nature of the stone along with the local stresses and erosion by the stream combine to give this unnamed side valley of the Grand Canyon such a unique (and highly photographed) look. 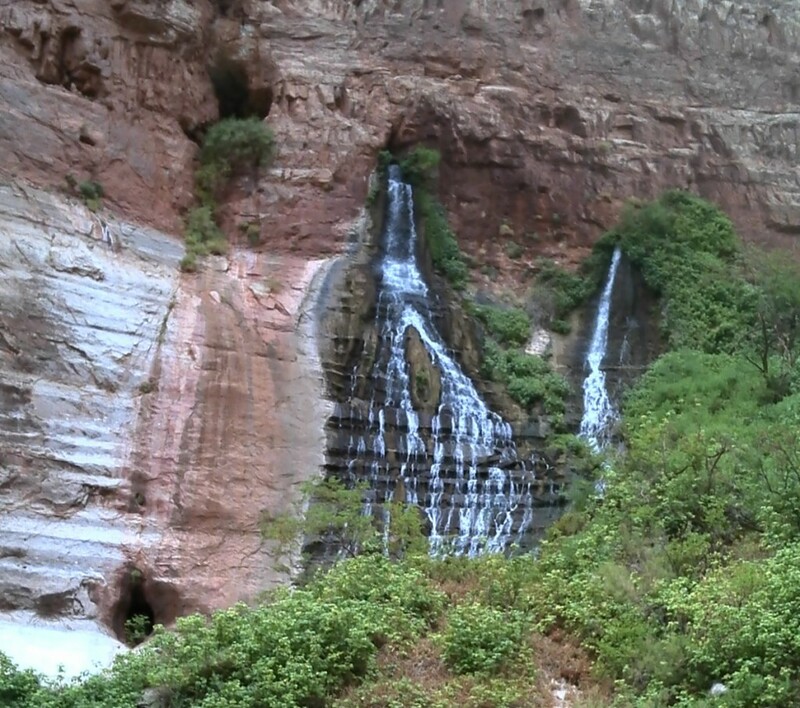 Springs emanating from the fractures and karst in the Redwall-Muav Limestone Aquifer provide an oasis in the Canyon and a needed water source for travelers. 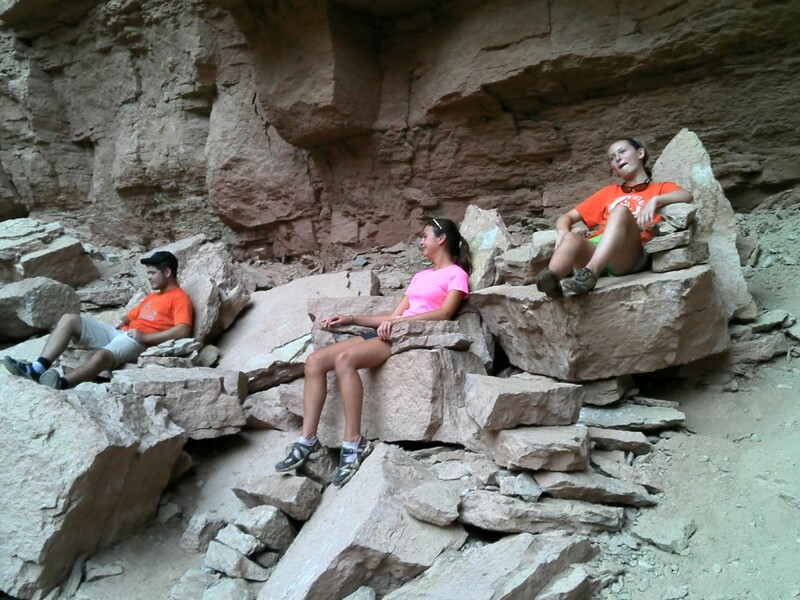 Some of the group reclines on chairs in the Throne Room at Dutton Spring in the Redwall Limestone. 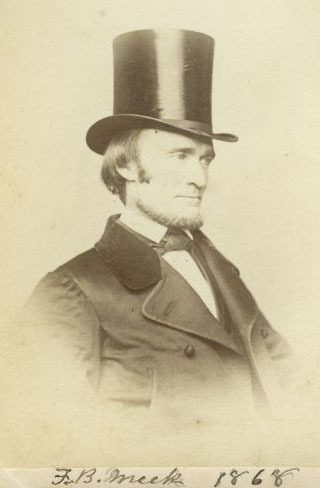 Clarence Dutton (born in Wallingford, CT) published one of the earliest geologic studies of the canyon in 1882. 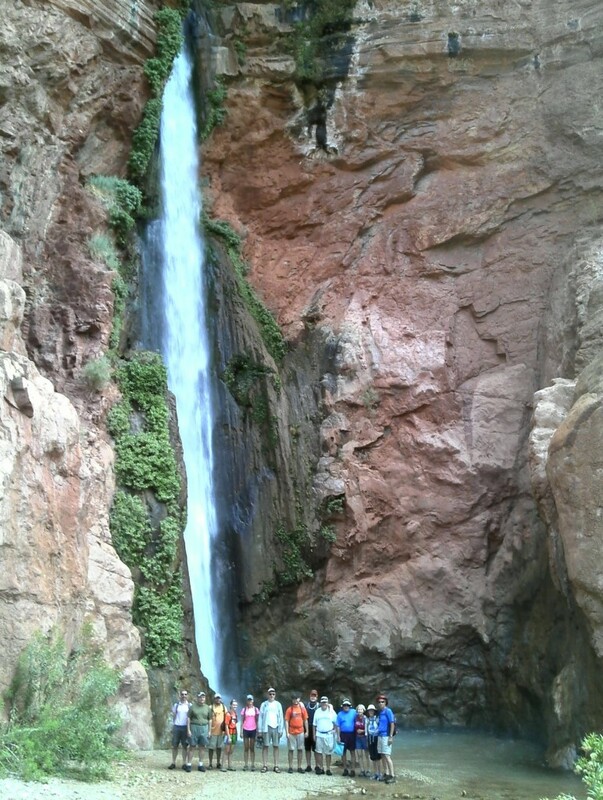 An inside-out waterfall (JP’s term). Note the encased waterfall of travertine. 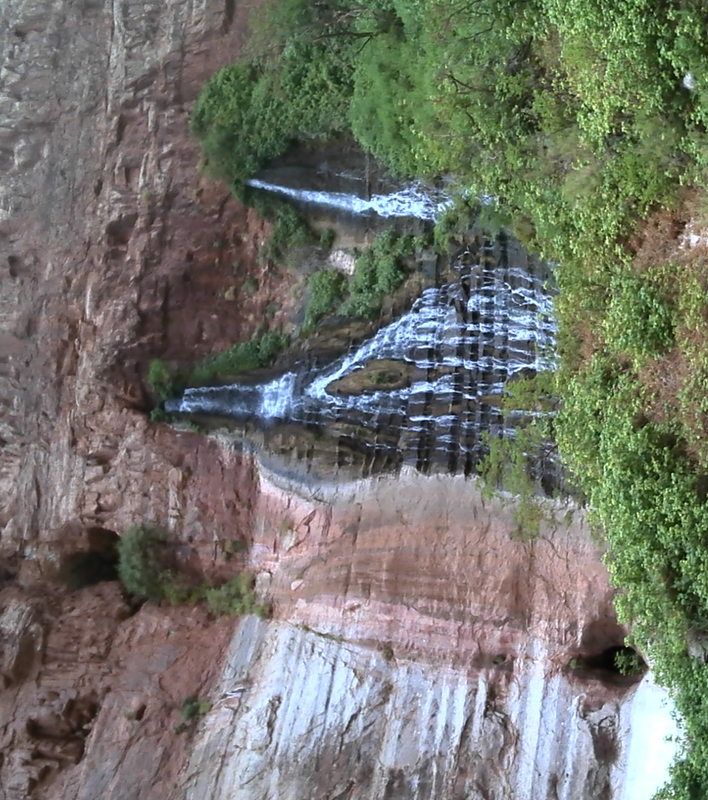 Three physical effects can lead to travertine deposition at waterfall sites: aeration, jet-flow, and low-pressure effects. The three physical effects are induced by two basic changes in the water: an accelerated flow velocity, and enlargement of the air-water interface area. These two changes increase the rate of CO2 outgassing so that a high degree of supersaturation of calcite (travertine) is reached, which then induces travertine precipitation. 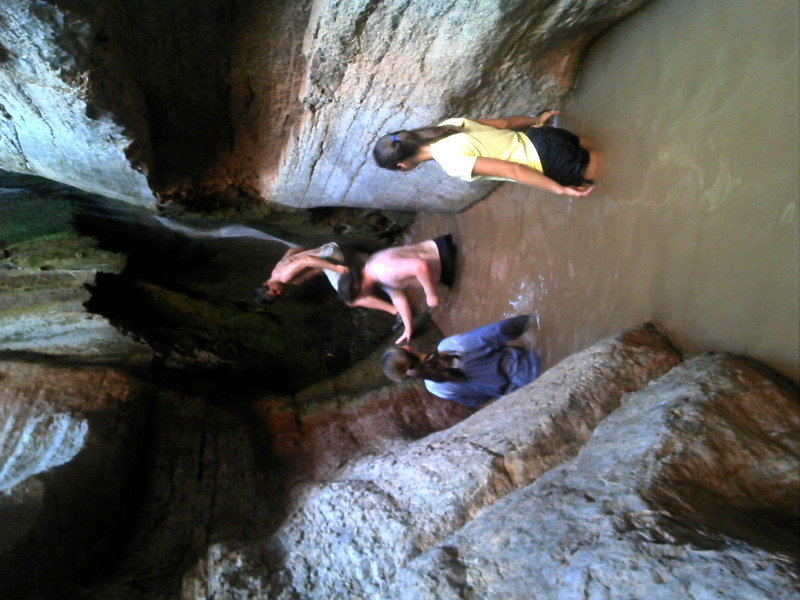 Note also the four intrepid explorers who facilitated the older folks into getting more involved with the water holes and falls. 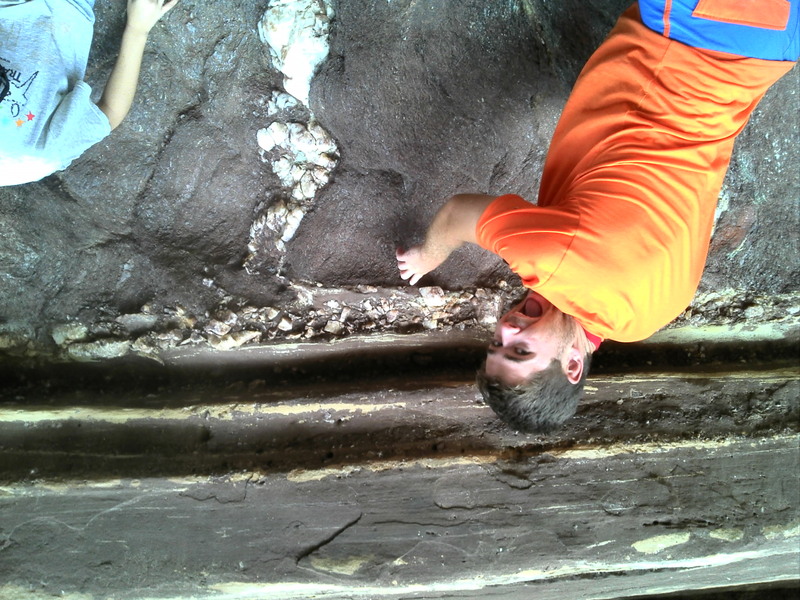 Robbie reacts strongly to the Great Unconformity (aka Powell Unconformity). 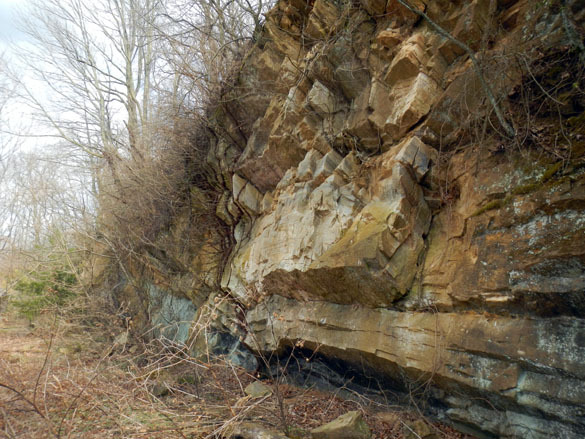 This gap in the geologic record is between the lower Vishnu Schist, Precambrian in age and the upper Cambrian Tapeats Sandstone. About 1 billion years is missing at the boundary where Robbie points. Think also about the burial and exhumation stages that must occur to form this, it is quite profound. 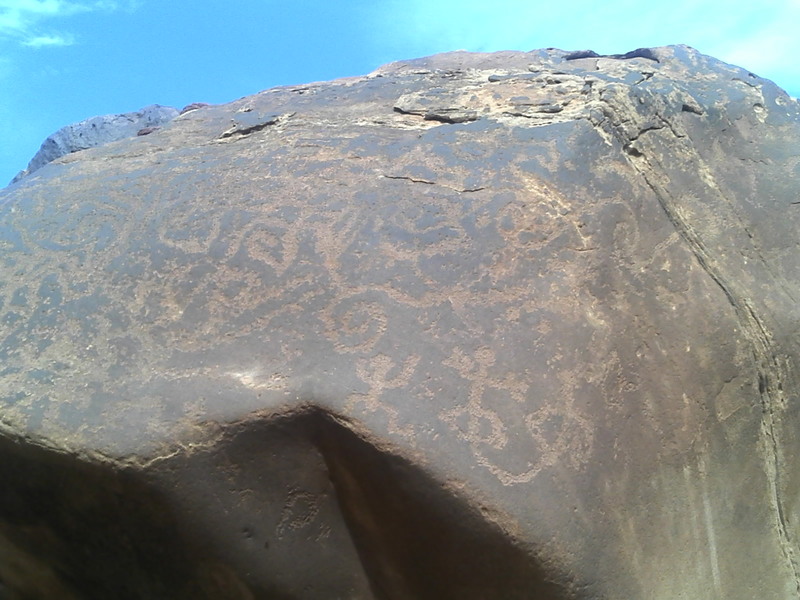 Anasazi petroglyphs – this site is dated to AD 1000-1300 and perhaps was abandoned when the Medievel Anasazi droughts descended on the region. Anasazi ruins – perhaps this outlook spot was occupied by the higher-ups in the society with others practiced dryland farming the floodplain of the Colorado River below. 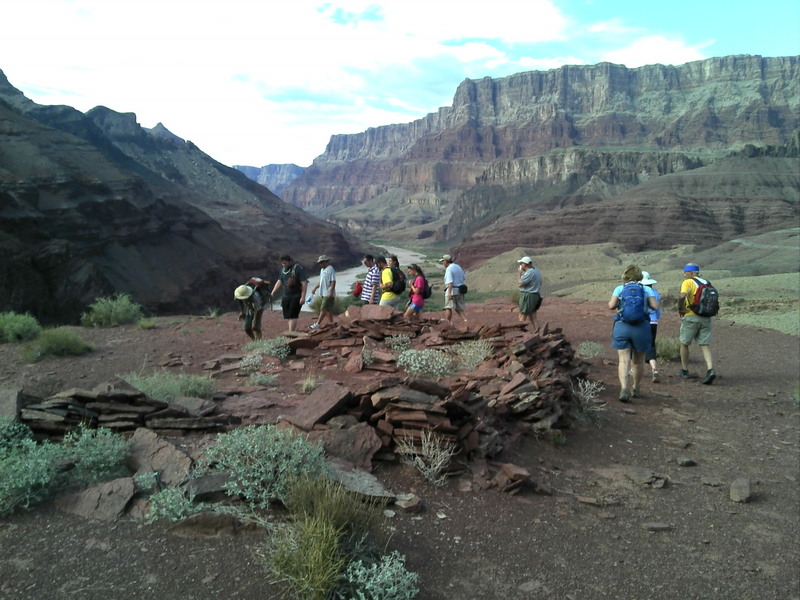 The group on the overlook point – farther up-valley another settlement is located within sight of this point. 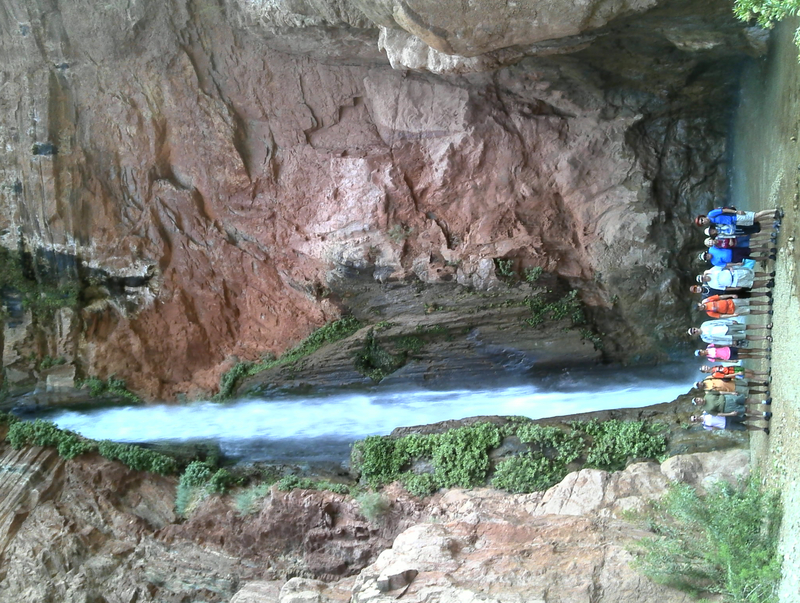 Deer Creek falls – one of the great falls in the Canyon. 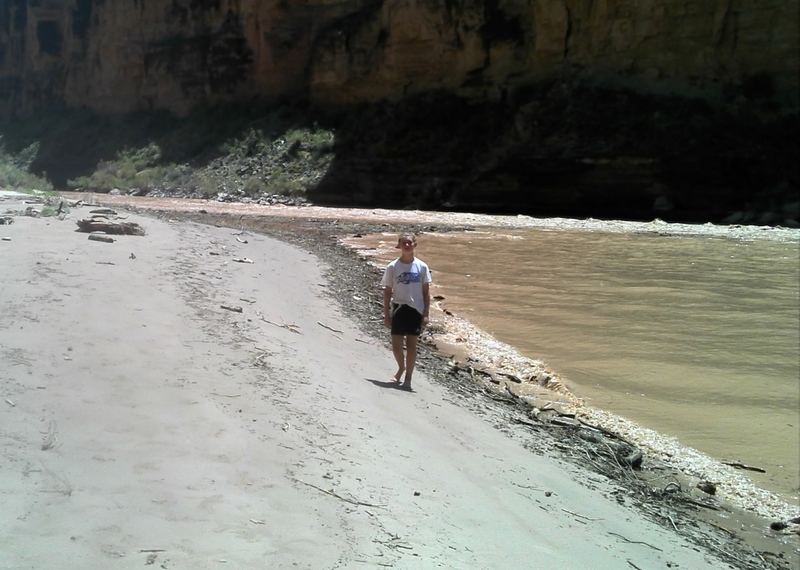 This stream was rerouted when a landslide dammed the Colorado and displaced the stream. The slide occurred shortly after the damming of the Colorado River by lava flows downstream. 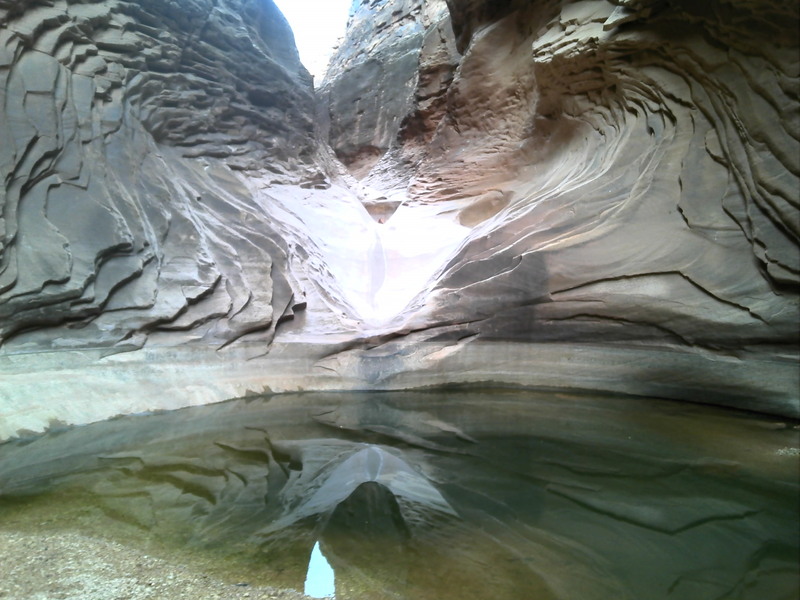 This new lake then saturated the Bright Angel Shale, which formed the slip surface of the massive landslide. The team scopes out lava falls a class ten rapids. 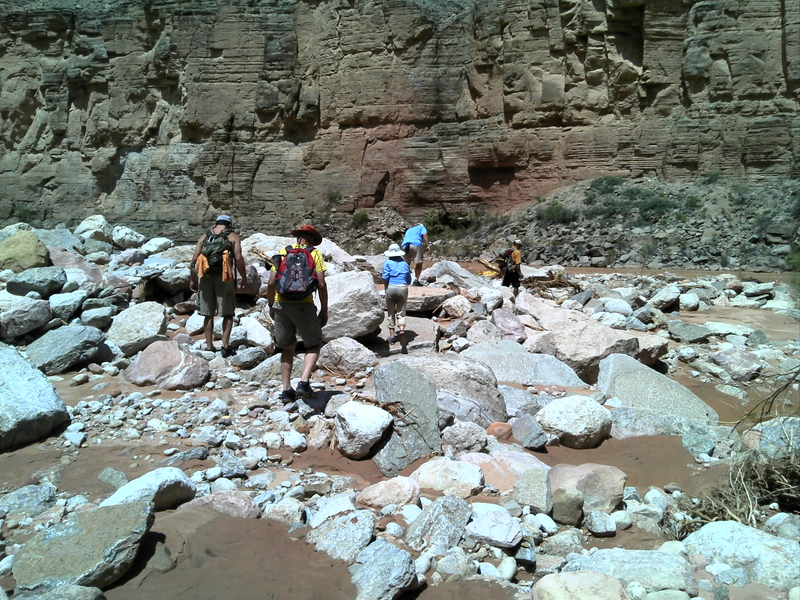 Most rapids exist where side canyons bring in large boulders in debris flows that accumulate at the confluence of the tributaries and the Colorado. 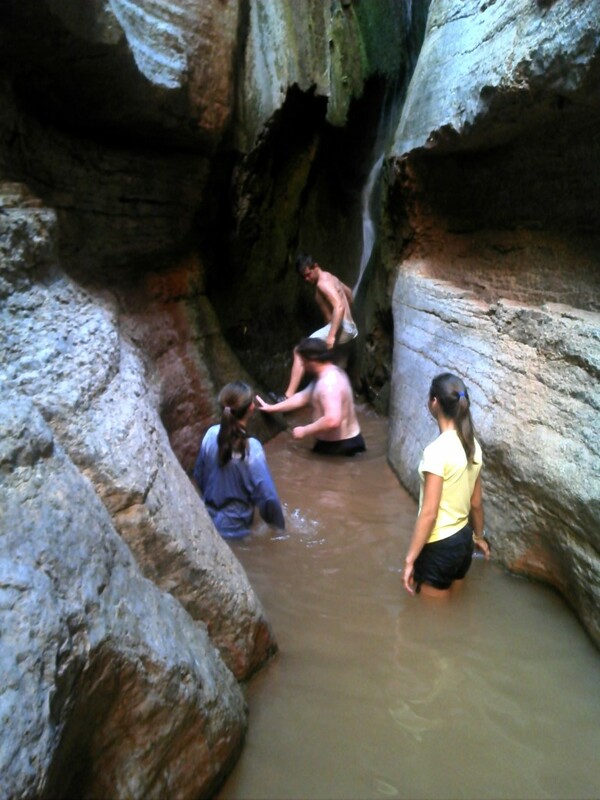 A side canyon that experienced a debris flow a few weeks before our trip. In the distance is the Colorado River – it is easy to see how these rapids are evolving as flash flooding and debris flows swept boulders and debris to the river. The tributary was dry the day of our visit. During our stay in the Canyon there was a massive storm event in the Havasu basin on 1 August. 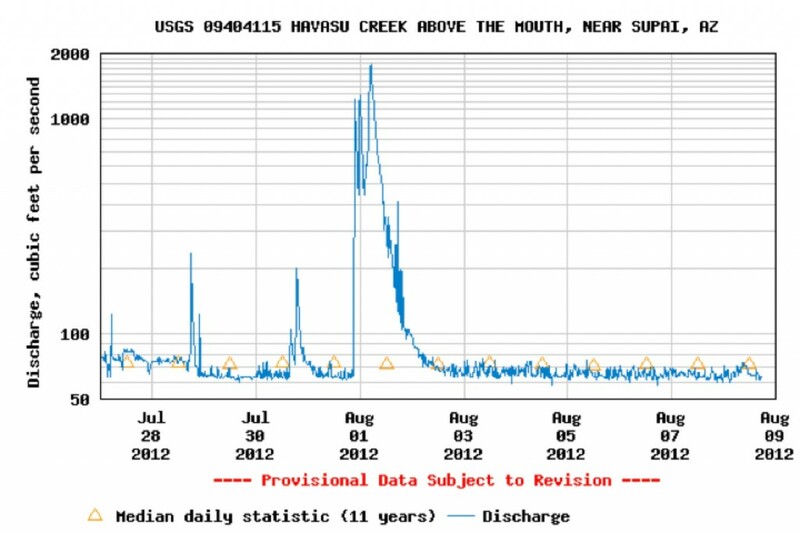 Above is the hydrograph showing the flash flood. We were unable to visit the Havisu Creek the next day because of the high flow. Below one can see the sediment and debris rich water in the Colorado River. Note also on the hydrograph that we had more than one rain event during our days in the Canyon. JP and Phil almost had to evacuate our camp as the Colorado was rising feet per hour. The flash flood on 1 August flushed out an amazing amount of debris that included more logs and tree debris than seemed to be growing in the canyon. This beach and eddy in the distance is full of wood and debris. 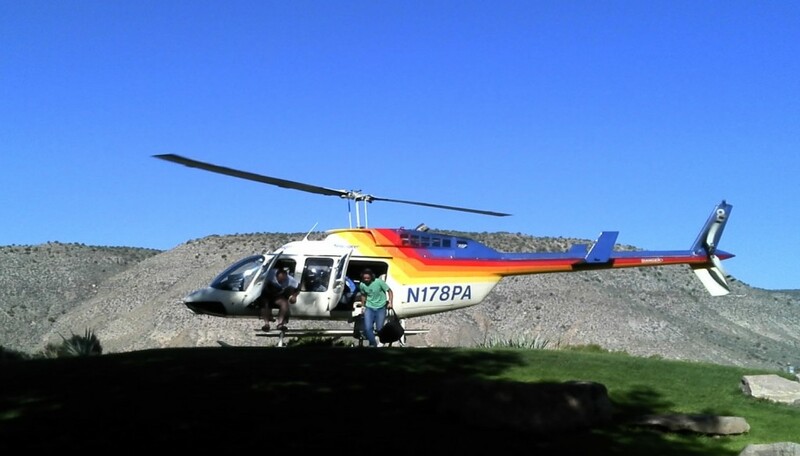 Flying out of the Grand Canyon to Bar Ten Ranch by helicopter. 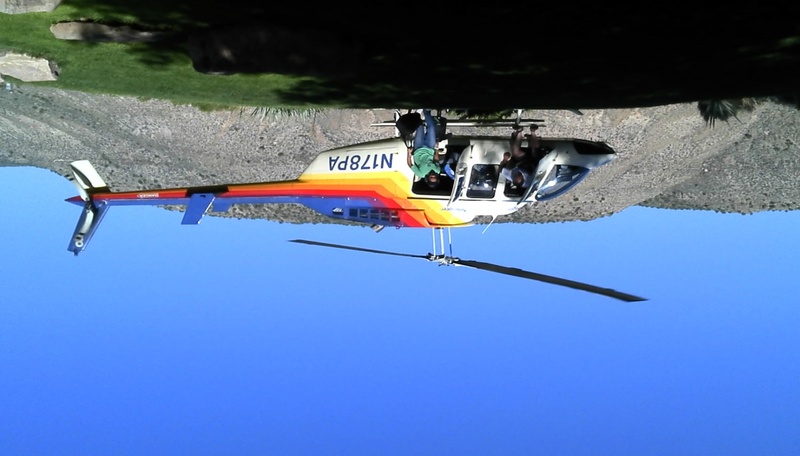 We then took a fixed wing flight out to the Flagstaff Airport. The first story about this iconic fossil is the trouble I went through to get the photograph above. Our specimen of Marrella splendens is preserved in the common Burgess Shale fashion as a thin dark film on a black piece of shale. A normal photograph would show just a black rock with a grayish smudge. To increase the contrast, I coated the fossil with mineral oil and used very bright lights to capture the image. 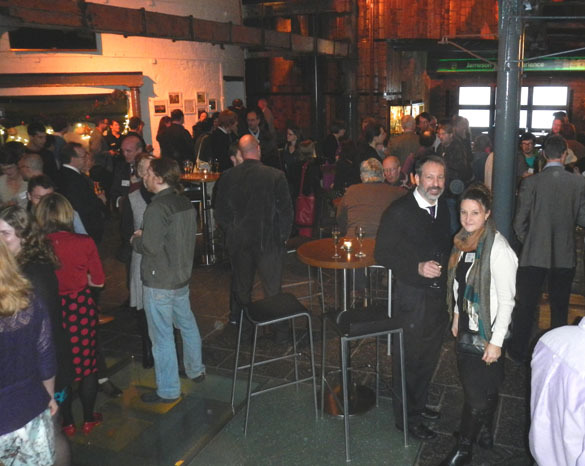 I then tweaked the contrast further with Photoshop. 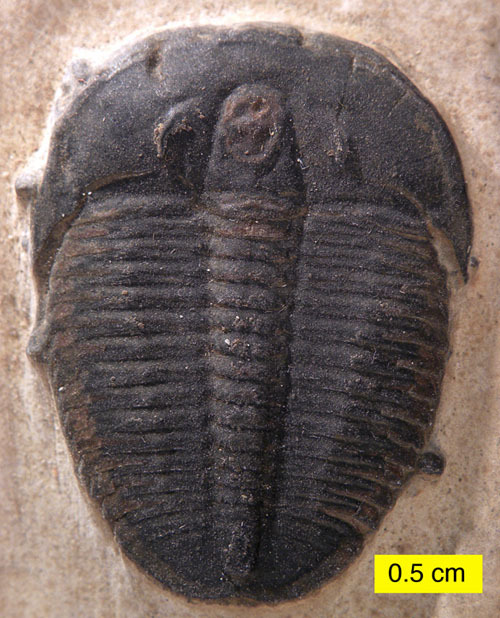 Curiously, a black envelope appeared around the specimen that resembles the famous dark stain found with some Burgess Shale fossils. It may be remnants of body fluids. 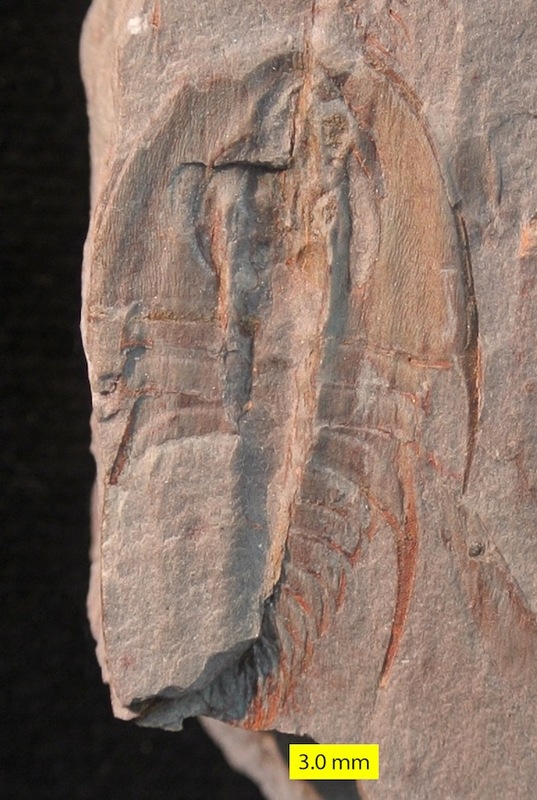 Before I go further, I must clarify the origins of this fossil from the Burgess Shale (Middle Cambrian) near Burgess Pass, British Columbia, Canada. I did NOT collect it. The Burgess Shale is a UNESCO World Heritage Site, so collecting there is restricted to a very small group of paleontologists who have gone through probably the most strict permitting system anywhere. 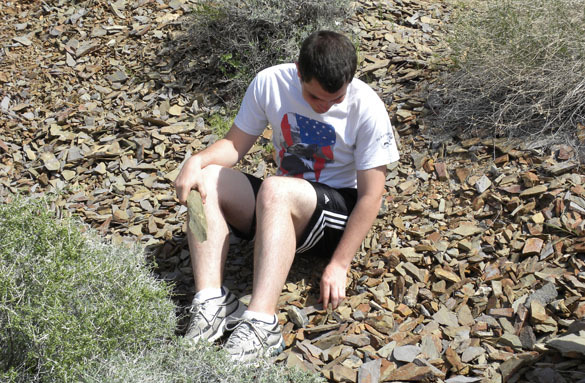 I had a wonderful visit to the Burgess Shale with my friend Matthew James in 2009, and we followed all the rules. 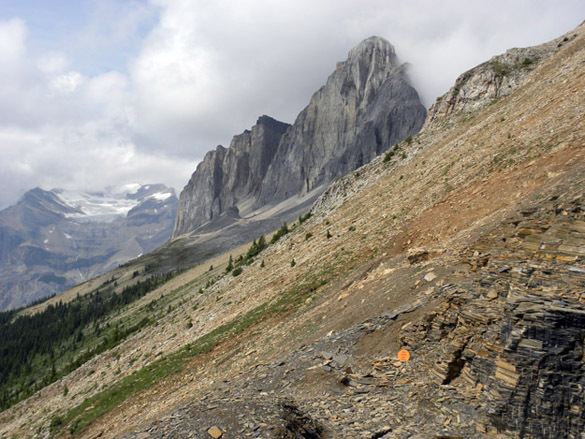 (The above is a photo of the Burgess Shale outcrop and its extraordinary setting.) Our Wooster specimen was in our teaching collection when I arrived. I suspect it was collected in the 1920s or 1930s. 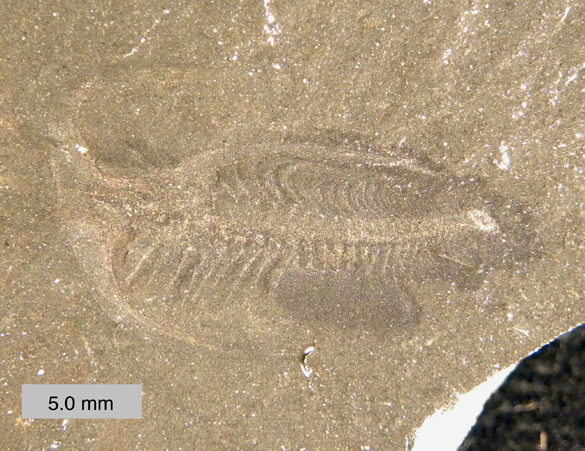 Marrella splendens is one of the most common Burgess Shale fossils, so no doubt there are many out there in older collections. 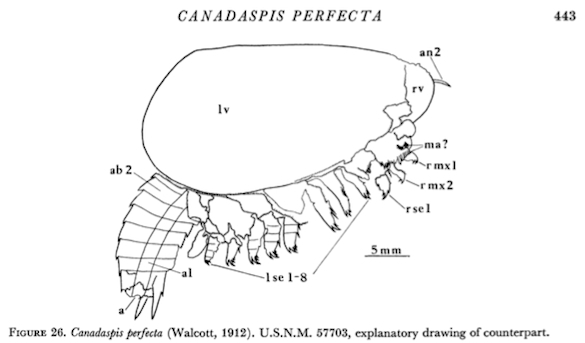 Marrella splendens is supposedly the first fossil Charles Doolittle Walcott discovered in the Burgess Shale in 1909. He called it a “lace crab”, and then later as a strange trilobite. 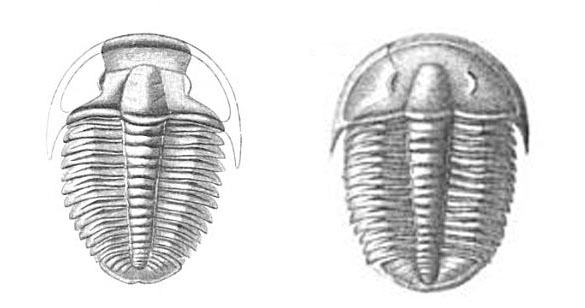 Later work by Harry Whittington demonstrated that it was neither a crab nor a trilobite. 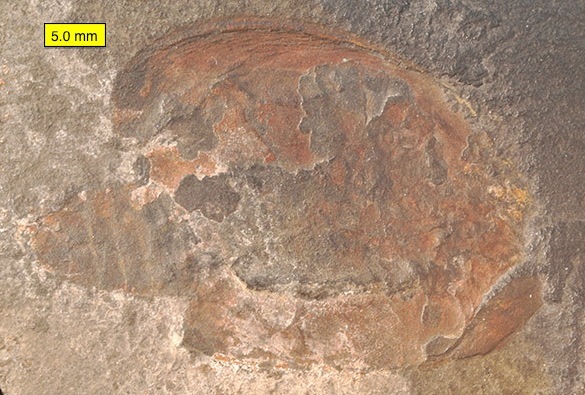 It is likely a stem-group arthropod (near the base of arthropod phylogeny). 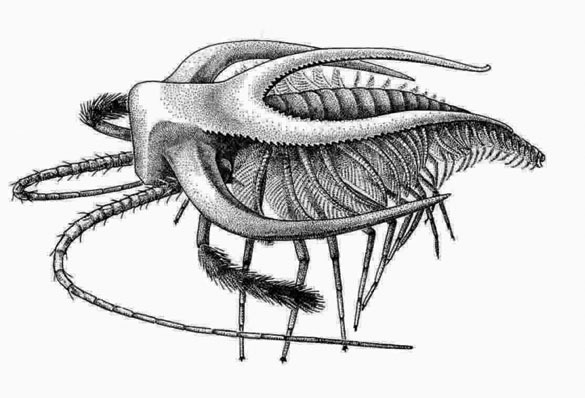 Marrella splendens was probably a bottom-dwelling deposit-feeder living on organic material in the seafloor sediment. There are thousands and thousands of specimens known in the Burgess Shale. They are preserved in many different angles, providing the first evidence that some sort of sedimentary mass movement was involved in the formation of this famous unit. 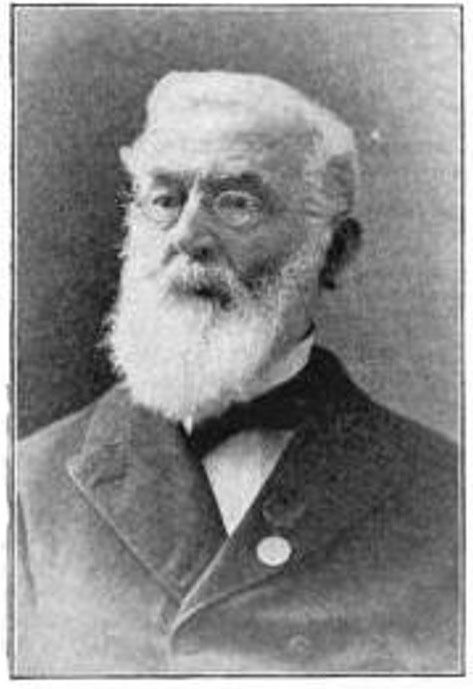 Walcott invented the name Marrella in honor of John Edward Marr (1857-1933). Marr was a paleontologist at Cambridge University in England. By the end of his career he was a Fellow of the Geological Society and the Royal Society, hence FGS and FRS follow his name. García-Bellido, D.C. and Collins, D.H. 2006. 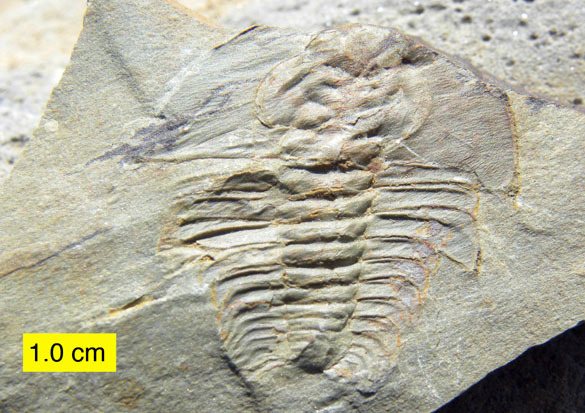 A new study of Marrella splendens (Arthropoda, Marrellomorpha) from the Middle Cambrian Burgess Shale, British Columbia, Canada. Canadian Journal of Earth Sciences 43: 721-742.